My best friend of many years recently had her first baby, Oscar. He is gorgeous, not that I am biased in any way! We took some really good photos and I wanted to get them framed as a special present. At first I went everywhere trying to buy a finished frame like I had in mind, which turned out to be impossible. I then looked at bespoke framing, which was not only confusing with too much choice, but also worked out extremely expensive. I was also aware that once I had framed one I would like to frame more, not only for my friend but also for my family as gifts and presents, as well as my own memories! I started looking into courses, both locally and at college. Again they seemed confusing and quite intense. 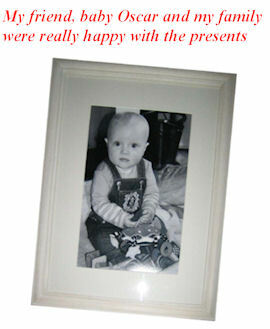 I eventually found a website www.diyframing.com that seemed to offer everything from training to tools and materials. I gave them a call and for once actually spoke to someone who understood straight away what I was trying to do! 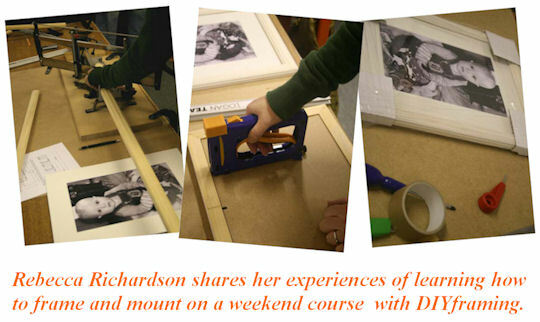 They offered me a few choices and I booked myself onto a weekend framing and mounting course. I thought, ‘Well I might as well learn how to mount as well as frame’. The course was in December, and I travelled to Beaconsfield where they have a lovely studio on a farm. The trainer and expert Alex was great, helpful and very patient with the group of ten people! The first day was all about framing. We learnt how to measure, cut and create the perfect frame. Skills we learnt also included glass cutting and mount making in order to reflect the picture in a special way. At the end of day one I had framed Oscar in a gorgeous lime waxed frame with a cream mount. I used the correct materials and sealed it perfectly so there would be no possibility of the tape eroding my picture, or any moisture getting in. I was very proud at the end of day one and eager to show off my beautifully-framed finished bespoke picture! Day two saw us learning about mounting in more detail, including double layering for a very special effect – bringing my pictures to life whilst highlighting amazing colours that I hadn’t really noticed before. I learnt how to make invert cuts that add a new depth to my pictures, and fancy edges that added a prestige look to some of my sepia family pictures. At the end of the course I had lots of mounts to take home, which I had made myself, and my finished framed photo for my friend. Alex and the group were great, I made a few friends and exchanged phone numbers with some of the business people, who had printing facilities for me to get some more of my pictures produced. I was very happy, I had learnt a new skill that was practical and quite special to me – being able to frame my pictures for friends and family, and making those unique moments and occasions last forever. I bought some fairly basic tools from www.diyframing.com; I was tempted at some of their offers of bigger, faster equipment but my tools were a good start. I also bought materials and mount board from them. I used their ‘chop’ service to get pre-cut moulding to make my own frames (the saw and me didn’t quite see eye to eye but the chop service is a great solution). My friend, baby Oscar and my family were really happy with the presents and the fact I had taken the time to go and do the course! The surprising side to my course is that since my lovely creations have been distributed to my friends and family, I have been asked or should I say ‘commissioned’ to bespoke work. My pieces of work have been hung up in many houses and that has actually reated a bit of a buzz between friends of friends to the point I am being asked to do more and more work. It is all quite new and quite exciting, I am by no means an expert but I enjoy it and I think it shows in my finished pieces. It makes the framed pictures quite personal ; I can make sure they blend with home décor and even frame the children’s art masterpieces from school ! Well that’s my story and the good news is I am thinking of making it into a business. I have booked myself onto the next course with DIY Framing ‘Canvas Stretching’ in February, as I have been asked whether I can do canvas.. Well I will be able to very soon, and who knows from there. I would like to thank the team at DIY Framing, they have been fantastic and by far the most reliable, helpful information. I buy all my tools and materials from them now and the service is great. They have even told me that they are going to be running business-style courses from mid 2008 which means that having my own framing, mounting and canvas pictures business is looking even more likely for 2008.